Quali-Dent is committed to helping their existing and new clients to achieve the best possible oral health. With our comprehensive dental hygiene care, we personalized your care to include more than just a cleaning. 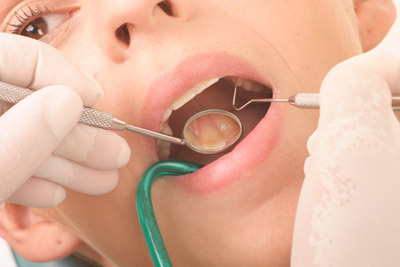 It also provides us with an opportunity to determine your specific needs and susceptibility to gum disease. If the specific needs are unknown, such infections may damage bone or destroy tissues around the teeth. Gum (periodontal) disease is very common and is a bacterial infection (colorless) caused by plaque. As this sticky, bacteria-filled film hardens, it becomes tartar which is more difficult to remove. If this bacterium is not removed properly, there is a great potential to destroy gum tissues and more advances stages of gum disease to follow. Should the plaque move further down the tooth root, it has potential too to destroy supporting bone which may loosen teeth. Since gum disease is a main cause of tooth loss in adults, regular dental exams and cleanings and brushing and flossing in between visits is vital to keeping your teeth. Quali-Dent wants your teeth to last a lifetime thus; we will work with you in creating and maintaining healthy gums and bones. Call us today for your oral hygiene therapy (cleaning) appointment at 622-3777. In addition to cleaning your teeth, our hygienists will also polish your teeth to a beautiful shine. Many patients are fortunate to have insurance coverage. Coverage should not affect your decision in your dental health plan. You will save money and enjoy daily living more by using a little preventative maintenance avoiding poor oral hygiene. Quali-Dent recommends and encourages twice-daily brushing and regular flossing between in-office visits, designed to maintain your smile’s health and beauty. In-office visits are recommended every 6-12 months. Dental plaque is a soft whitish deposit that forms on the surface of teeth. It forms when bacteria (germs) combine with food and saliva. Plaque contains many types of bacteria. You can remove plaque by good oral hygiene. Calculus, sometimes called tartar, is hardened calcified plaque. It sticks firmly to teeth. Generally, it can only be removed with special instruments by a dentist or dental hygienist. Your teeth are not only important part of your mouth. Your gums too are essential to oral hygiene. Should you have any questions about establishing a dental hygiene routine, remember, we are here to assist you.